Look who's pulling himself up!?? It was a big day in the Swinehart household. Landin is changing daily. 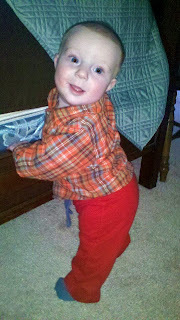 We think that he will be skipping the crawling stage and going straight to the walking stage. Our strong boy has started pulling himself up on things and he is SO wonderful at it! So we had some walking time, some church time, some skyping time and a lot of family time! It was a wonderful, perfect Sunday!